Dogfighting is a type of blood sport in which dogs are forced to fight one another for the entertainment and/or profit of spectators. Dogfighting is one of the most heinous forms of animal cruelty. Dogs used for fighting are typically raised in isolation, so they spend most of their lives on short, heavy chains. They are regularly conditioned for fighting through the use of drugs, including anabolic steroids to enhance muscle mass and encourage aggressiveness. Dogfighting victims may have their ears cropped and tails docked close to their bodies to minimize the animal’s normal body language cues and to limit areas that another dog can grab during a fight. Fighters usually perform this cropping/docking themselves using crude and inhumane techniques. Dogfighting is often associated with other forms of criminal activity including illegal gambling and possession of drugs and firearms. 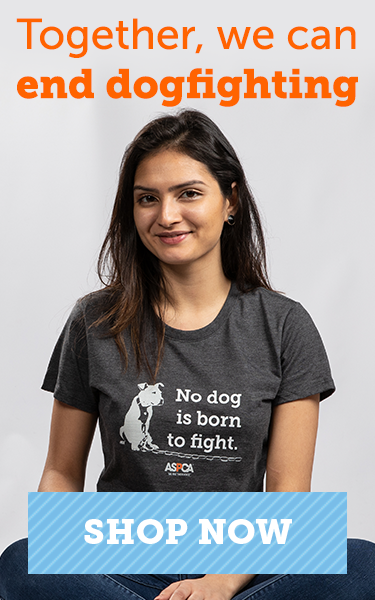 By our estimate, there are tens of thousands of dogfighters in the U.S., forcing hundreds of thousands of dogs to train, fight, and suffer every year. To learn more, visit A Closer Look at Dogfighting. If you suspect dogfighting or other animal abuse is happening in your community, please speak up. Find out how to report animal cruelty. It is important to be able to recognize the signs identified with dogfighting so that you can report any suspected dogfighting activity to your local authorities. Keep in mind that in urban communities like New York City, dogs used for fighting are often found living in secluded, indoor areas such as basements, where they are hidden from public view. Their ears may also be cropped. There is no evidence that banning certain dog breeds makes communities safer or prevents attacks. Learn more about how and why this brutal form of cruelty occurs. In 2007, the ASPCA participated in the raid of Bad Newz Kennels. Learn more about this historic case and its aftermath.